SONAR AS - This product has limited restrictions. REWARD - 2-3 days on Drinking - 1-3 days on Live Stock - 2-3 days on Turf - 5 days on Crops. Always read label and follow all safety precautions related to this product. SONAR AS - Effective Solutions for Duckweed, Submerged and Emerged Vegetation. REWARD - acts as a contact killer in plants by disrupting cellular membranes. Surfactant is recommended for use with this product. CUTRINE-PLUS acts as a herbicide in controlling Chara, Nitella, Filamentous Algae, and the rooted underwater weed Hydrilla Verticillata. APPLICATION RATE FOR REWARD: Normally 2 2/3 oz. per gallon. Spray directly on emergent and submerged vegetation. Be aware of drift and applying on desireable vegetation. Never treat more than 1/3 of your body of water at a time giving 7-10 days between treatments. These rates may not be applicable for your circumstance or situation. Use recommended rates & percentages on label. APPLICATION RATE FOR CUTRINE PLUS: Tank mixed with Reward and Aqua-King for an effective treatment on Watermeal. APPLICATION RATE FOR SONAR AS: 1 pint = 1/2 acre - 1 quart = 1 acre. Sonar can be tank mixed applied as a submerged treatment. Sonar, The Flexible Solution Sonar aquatic herbicide offers both selective and broad-spectrum control capabilities. Since each lake is different in shape and size, water flow pattern, aquatic plant species and type of use, the development of an effective aquatic vegetation management program requires an aquatic herbicide formulation that is flexible enough to adapt to a wide range of applications. Whether the intended use of a lake is fishing, swimming or simply aesthetic beauty, Sonar can provide an effective plant management solution. Selective Control Sonar selectively manages problem weeds for a year or longer, with minimal risk to the environment. That makes water usable for recreation, brings the fish population back into balance and restores property values. Water can be enjoyed the way it used to be, because even directly after application, Sonar won't restrict swimming, fishing or drinking. No other aquatic herbicide provides this flexibility. Effective Solutions for Duckweed, Submerged and Emerged Vegetation. Reward is a broad spectrum liquid aquatic herbicide for use in and around still lakes, ponds, ditches, non-crop or non-planted areas. Reward acts as a contact killer in plants by disrupting cellular membranes. Loss of these membranes allows the active ingredient to move into the plant and "short circuit" photosynthesis. Shipped in 1 Gallon Containers. WHAT IS CUTRINE-PLUS? CUTRINE-PLUS is an algaecide which controls existing algae and inhibits rapid re-infestation. Cutrine-plus is available in individual one gallon bottles or by the case. Each case contains four one gallon bottles. 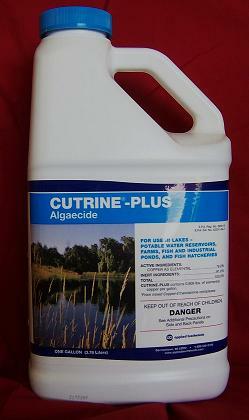 CUTRINE-PLUS also acts as a herbicide in controlling the rooted underwater weed Hydrilla Verticillata. CUTRINE-PLUS is U.S. E.P.A. registered for use in drinking water reservoirs, farm fish and industrial ponds, golf course water hazards, lakes, fish hatcheries and raceways, irrigation water conveyance systems such as canals, laterals and ditches. APPLICATION RATE: CUTRINE-PLUS- is applied at a rate of 0.6 gallon per acre-foot (43,560 cubic feet) of water to be treated for planktonic and filamentous algae, 1.2 gallons per acre-foot for Chara and Nitella and 1.2 to 3.0 gallons per acre-foot for Hydrilla. METHOD OF APPLICATION: CUTRINE-PLUS should be diluted with at least 9 parts of water to facilitate even distribution during application. Surface spray is most practical for treatment of planktonic and filamentous algae. Bottom-growing algae should be treated by underwater injection or by application of CUTRINE-PLUS GRANULAR. Hydrilla can be treated by surface spray or underwater injection. N.I.S. 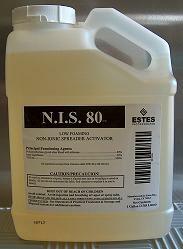 is a low foaming, spreader-activator with buffering agents, formulated for use with aquatic herbicides. N.I.S. increases contact activity and improves spray penetration. Commonly used with Reward, Habitat and other aquatic herbicides.